Exceptionally robust recording app, and I reviewed many thoroughly over a few days before settling on this one. You can’t go wrong with this one. I do wish for more hands-off support, using headphone button control & Siri implementation, so one doesn’t have to unlock the screen to access Files and recording/playback. I know the company offers dedicated foot pedals to automate some of these processes and offering alternatives would eat into some sales, but it would also make it a powerfully accessible app on all levels and miles ahead of competition. This software is very well-designed, user-friendly, feature rich, and a pleasure to use. This software is well designed, user friendly, feature rich, and a pleasure to use. I can insert a change or correction into an existing dictation before sending it as an audio packet, wirelessly from my iPhone, to be transcribed. It all works perfectly. This software has some unique features. It allows you to insert a new section of dictation within an existing section of dictation. 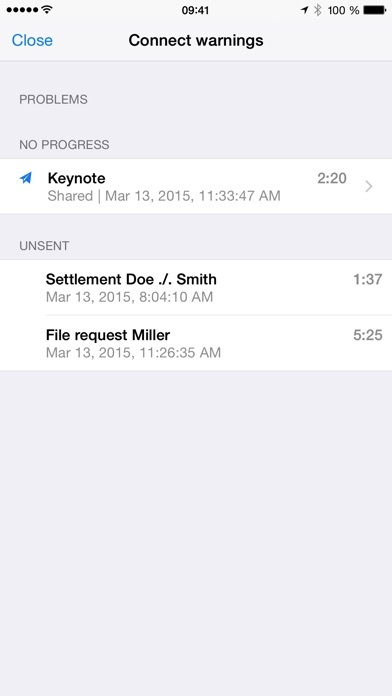 It also allows you to delete an existing section of dictation, a very useful feature. Needed this for transcription purposes and it doesn't do that at all. Total sham a waste of money. I'm a lawyer who has been practicing for more than 35 years. I started in an era where lawyers dictated rather than typed out briefs and memos on computers. I've evolved from desk-model dictation machines, to hand-held recorders, to digital dictation devices. This app is just as good if not better than any digital dictation device I've ever used. Now, all I need is my mobile phone and I can dictate anytime, anywhere. I can immediately text or e-mail the dictation to my secretary who can easily transcribe it. It saves me time and money. I've used this app and its successive versions and have liked them all! I've not experienced any issues, bugs, or problems. Very good product. No issues. Simple to use. In my work I need to review documents and dictate reports. This inexpensive app is perfect for that, saving me over $400 for a full service dictation device that I really don't need. I am able to dictate, review, and overwrite my dictations with ease. I am also able to then email the dictations to myself where I can download them onto my computer, and then FTP then to my transcriptionist. I have not had any difficulties as of yet and have been using this for well over six months. Support follows up on issues and notifies you when completed. Product works great for sending dictations through Dropbox. This allowed us to create a workflow, and transition our attorneys to a digital environment. Very easy to use. Convenient. Been using for over 5 years. Must have!! This application works well for me in my law practice. I wish I bought it sooner. 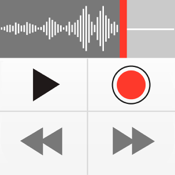 My "go to" app for recording sound. 3-22-17. For some reason the App asked me to offer a rating. This App remains my preferred App for recording, hands down. I own about 5 recording Apps, and the others are just taking up space because I'm a rat-packing hoarder of Apps. I could delete the rest and be fine, but then my "Recording" folder would disappear. Oh me, oh my, how would I deal with that? In the new version 12.3.1 the quick share button is not working! Please fix ASAP. Is there a way to download a previous version until this is fixed? I’ve been using the product and found it to be helpful useful and time efficient. This app is great. Very user friendly and can be used remotely. Love it! I have been using this app ever since I got my Ipad to dictate pretty lengthy reports to send to my secretary in the office via e-mail, from anywhere, and it is fabulous. Never had any type of glitch. It is very, very user friendly and I love it. I love this app. So easy to use. However my secretary hates it, saying the sound quality is horrible. I have to hold my phone just the right distance away and there cannot be ANY background noise. No more dictating in the car. Tried using headpiece with microphone but it would cut in and out. I have an iPhone 6. Anyone have any advice on how to improve the experience for my secretary . If it doesn't improve I am going to have to abandon it and return to my 1980s technology of a handheld mini recorder. Great app and easy to use. Mostly I use this app to record "interviews" with my aging parents about their memories of growing up and their early-marriage years. Video is nice but they are a little shy to be recorded that way but recording their voices-only seems less of a foreign idea to them. The user interface on the app is straightforward and the learning-curve short. I love this dictation app. I have it on both my phone & my iPad. I haven't had any problems with it. I'm a busy attorney and travel constantly. My secretary uses her current transcription software and I dictate on this. Works flawlessly. And inexpensive. Love this app. The app works well and is reliable. I use it for both directions and interviews. Best dictation app I've used so far. Many options for transmitting dictations. Very flexible. Very effective voice activated microphone. Use for medical clinic and for recording thoughts to review. Nice interface. 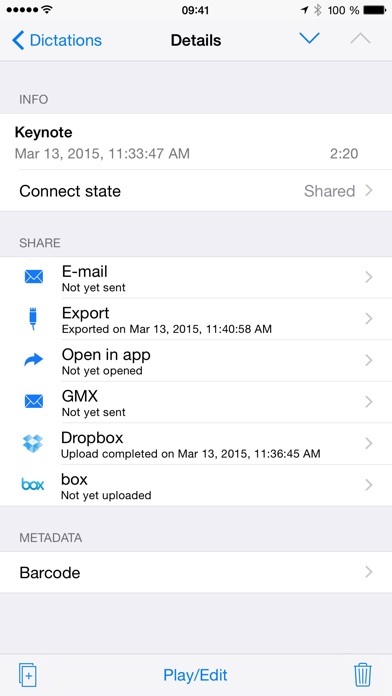 Really like the ability to upload to Dropbox or email. Improved recently with ability to upload several dictations with push of a button......still using this app 5 years after my initial 5-star review and still give it 5-stars. This app is completely invaluable to me and my law practice. It works perfectly and has really improved my productivity. If I could give 10 stars instead of just 5, it would be worth it. I use it daily. Recommend it highly. When I had a problem after updating, they were responsive. The app has worked seamlessly and I have had no difficulties with it. 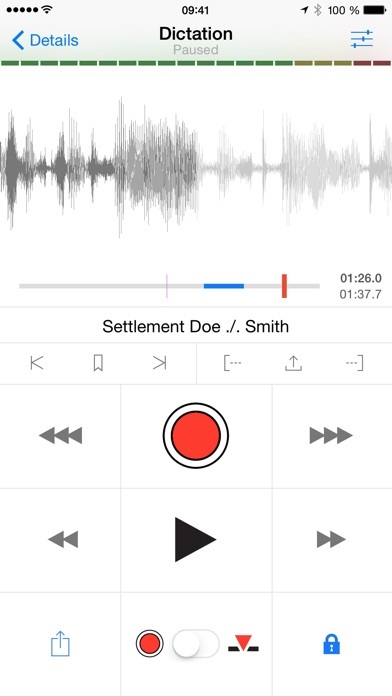 This app gives me the ability to dictate in the office and on the road, without having to worry about losing microcassettes or having to upload a digital voice file to a laptop or PC. The convenience of being able to dictate and send the voice file right from my phone makes this app invaluable. Great app, serves my needs pefectly. Works as advertised. 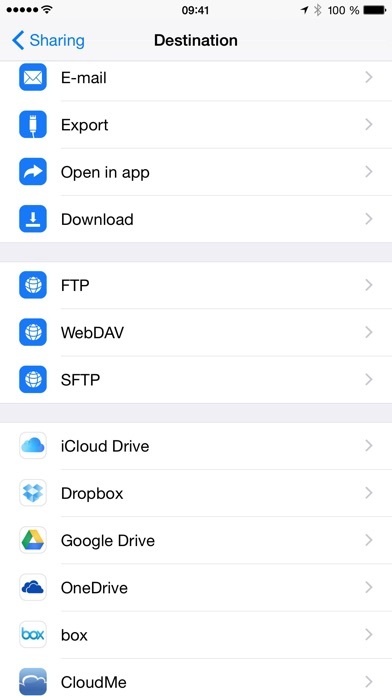 In fact, file sizes are smaller than the prior app I was using on Android phone prior to switching to iPhone. 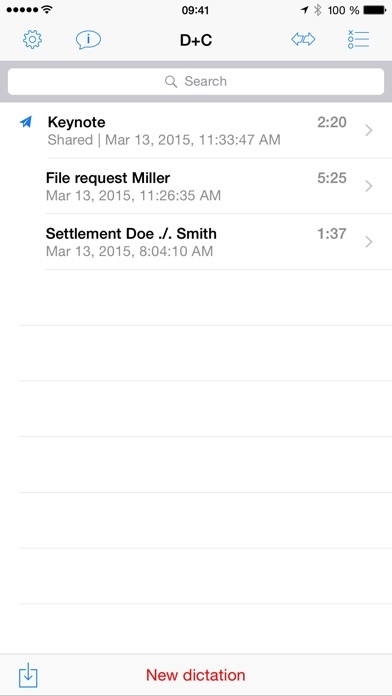 Can dictate longer, and files transfer quicker and easier via email. The only improvement I’d like to see is allowing a default send feature. The last (Android) app I used allowed me to save my assistant’s email address, a copy to office manager, and bcc to me for every dictation emailed out. In this app, I need to populate those fields each and every time. Otherwise, we’ll worth the money; no crashes; no bugs. I LOVE this app! It take the place of a lot of cumbersome equipment and is always available. I have not had one malfunction in nearly three years of use. What good is a dictation program if you have to pay extra for it to transcribe for you? Completely worthless. Definitely worth the $. Used it for 2 years and totally satisfied with its ease and competence. If you dictate reports, etc., to help make a living, then you have no business not owning this app. I am a neuropsychologist who uses this on a daily basis to dictate reports and progress notes for all of my patients. It's so simple. I dictate, then export to my computer, and type it in to Dragon, which transcribes it for me. Couldn't be easier or better. I have been using this App four years now. I am a practicing attorney of nearly 40 years of experience. We started with expensive desktop models with large cassette tapes and then graduated to minicassettes ultimately moving to digital recorders. When this app came out and I installed it on my iPhone, The transition was simple and smooth. I can dictate from anywhere and transfer the files. I use dropbox.